Brief introduction to Paleobiology of South American titanosaurs. | Letters from Gondwana. ← The early history of ammonite studies in Italy. Brief introduction to Paleobiology of South American titanosaurs. 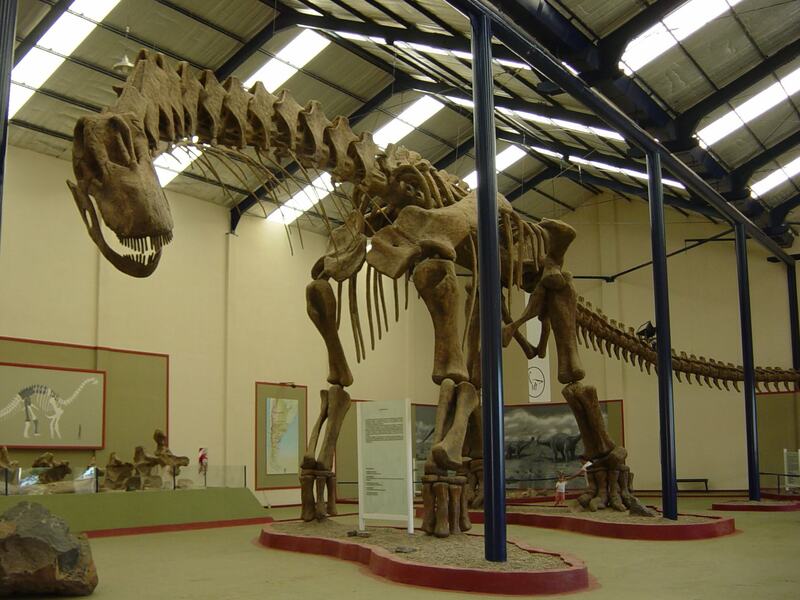 Argentinosaurus huinculensis reconstruction at Museo Municipal Carmen Funes, Plaza Huincul, Neuquén, Argentina. PLoS ONE. From Wikimedia Commons. Titanosaurus were a diverse group of sauropod dinosaurs represented by more than 30 genera, which included all descendants of the more recent common ancestor of Andesaurus and Saltasaurus (Wilson and Upchurch, 2003). They were important terrestrial herbivores during the Jurassic and the Cretaceous periods. The group exhibits a worldwide distribution and some of them, were the largest animals to ever walk the Earth: Argentinosaurus, Futalognkosaurus, and Puertasaurus surpassed lengths of 30m and masses of 70 tons. The discoveries in Patagonia of embryos, eggs (Chiappe et al., 1998, 2001; Salgado et al., 2005; García et al., 2010) and exceptionally articulated specimens show the importance of the South American record for understanding the phylogeny and paleobiology of titanosaurs. 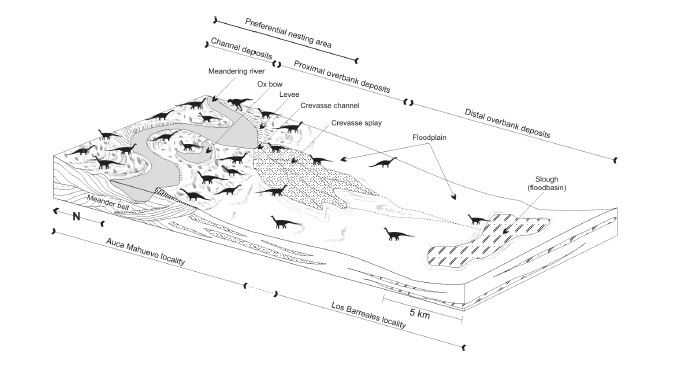 The hundreds of eggs containing embryos found in the outcrops of the Anacleto Formation at Auca Mahuevo and Los Barreales corroborated the hypothesis that sauropods were oviparous. The eggs were relatively small (10–25 cm of diameter) and were found in excavated nests. The embryos from Auca Mahuevo present an ‘egg-tooth’-like structure which is more frequent in altricial birds (García, 2007a, 2008). If we assume that titanosaurs followed a sequence of ontogenetic stages similar to modern birds, these embryos would correspond with the stage 36-37, within the 42 prenatal stages established for birds. The titanosaur embryos discovered in Auca Mahuevo are exclusively represented by cranial material. Comparing the skull of adults titanosaurs with the embryos from Auca Mahuevo, it seem evident that the Patagonian dinosaurs experienced a deep ontogenetic modification in this part of the skeleton. Ontogenetic variation in titanosaurian skull morphology: aof, antorbital fenestra; en, external nares; f, frontal; j, jugal; l, lacrimal; mx, maxilla; o, orbit; paof, preantorbital fenestra; pmx, premaxilla; qj, quadratojugal; vn, ventral notch. From García et al, 2014. The rostral portion of the embryonic skull never surpasses 50% of the total skull length while adult sauropods possess a relatively elongated skull. The premaxillae of the embryos have extremely short nasal processes contrary to those of adult titanosaurs. It’s possible that the remodeling of the premaxillae in the ontogeny has implicated the elongation of the nasal process as well, which in turn would be related to the ontogenetic retraction of the external nares (García et al, 2014). The type of teeth is basically similar in the embryos and those of the few known adult titanosaur skulls, which may be indicative of the same basic diet. The brain morphology shows a tendency to the reduction of the midbrain and the olfactory tract and bulbs. Titanosaurs also exhibit a reduction of the anterior semicircular canal of the inner ear and a robustness of the labyrinth in comparison with other sauropods. Shoulder and pelvic girdle architecture of titanosaurs suggests a broader posture than that other sauropods, which is related to a shift in the specific muscular attachments that would counteract the wide posture of the limbs (García et al, 2014). The ichnological record offers valuable information about different strategies of titanosaur locomotion and behavior. Most of the trackways are parallel and show the same direction of travel which is indication that titanosaurs moved in social groups. This entry was tagged Anacleto Formation, Auca Mahuevo, Earth Sciences, titanosaurs, Vertebrate paleontology. Bookmark the permalink. Pingback: A brief introduction to Dinosaur Herbivory. | Letters from Gondwana. Pingback: Introducing Gualicho. | Letters from Gondwana.